This evening, I had the opportunity of being part of the Rock Ed Original Project Grant launching which was made possible by the Original Havaianas. 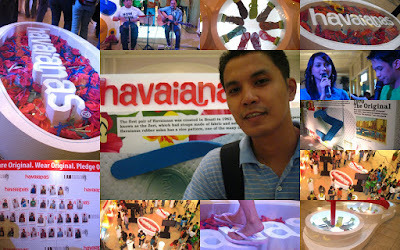 I would say that it was a perfect partnership as Havaianas is known for it unique flair and creativity. It is a company that was started in 1962 and, to date, produces its products in a single factory located in northern Brazil and they still use the same rubber formula. Rock Ed's Original Project Grant, on the other hand, fits well with its partner (Havaianas) as it launched its search for the most original youth -involved and youth-targeted projects. They are encouraging any individual or group aged 13 to 32 to e-mail their original ideas for implementation and the top three with most votes will receive a grant from Rock Ed in their partnership with Havaianas. The deadline for the sumbmission of entries is on April 4, 2009. During the project launch which was hosted by Iya Villania and Mo Twister and held at Power Plant Mall in Makati City, photos of traditional and online media partners and guests were taken and the participants were requested to write on their phots why they were original. Our photos were then posted on their wall and each photo placed on the wall was equivalent to an amount pledged by Havaianas to Rock Ed's Original Project Grant.